Indian skipper Mahendra Singh Dhoni has visited the construction site of his new house, which will be completed within a period of six months at Harmu in Ranchi yesterday. Dhoni has returned back to home recently after a tiring cricket schedule of more than three months, and he took a look at the design of house and also monitored the progress of the construction work of his new house. The fourth ODI match between India and West Indies has been washed away due to rain, as India won the series by the 2-1, which is their fifth consecutive ODI series win. The match was delayed due to rain and Indian skipper Mahendra Singh Dhoni won the toss and elected to field first against West Indies. Only 7.3 overs were bowled in which West Indies scored 27 runs with the loss of one wicket, and rain interrupted the match again, which was abandoned later after the continued showers at short intervals. After taking a lead by 2-1 in the series India will now take on West Indies in the fourth and last ODI at the St Lucia today to end the series on a winning note. In the previous rain interrupted match, the heroic inning of Indian skipper Mahendra Singh Dhoni led them to win by six wickets in a thriller, which went to last over of the match with India needing to score 11 runs from the last over of their inning. Ashish Nehra was impressive in the last match, while the form of fast bowler Ishant Sharma continued to worry Indian captain Dhoni. Dhoni & Yuvraj to start their new innings in Bollywood! Dhoni and Yuvraj to appear in a Bollywood film! Sounds strange but yes, you heard it right. Indian cricketers MS Dhoni and Yuvraj Singh are amongst the most talked about cricket stars and now it seems that both of them want to try their luck in Bollywood. As per media reports, Dhoni and Yuvraj will be acting for a film produced by Bollywood Dino Morea. It is also reported that Dino is also planning to rope in master blaster batsman Sachin Tendulkar for his film. Yuki Bhambri has stormed into the second round of the men’s single event of the International Tennis Federation (ITF) India F5 Futures tournament after defeating Ashwin Kumar in the first round at the DLTA Complex in New Delhi on Tuesday. Yuki, the fourth seeded, outplayed the Ashwin, the American of Indian origin, in the match as he defeated Ashwin in straight sets by 6-2, 6-0. Yuki took just 53 minutes to win rain delayed match against Ashwin in the $15,000 ITF tournament. West Indies has defeated India by eight wickets in the second ODI match in Jamaica on Sunday and leveled the four one day match series by 1-1. India skipper Mahendra Singh Dhoni won the toss and elected to bat first against West Indies. India team got to a bad start as they lost their three wickets for just 8 runs on the board and all team returned to pavilion for just 188 runs on the score in 48.2 overs. Dhoni was top scorer for India as he scored 95 runs, while the man of the match R Rampual took four wickets fore just 37 runs in his 10 overs for West Indies. After clinching a thriller at Jamaica on Friday, Indian tigers will take on West Indies in second ODI match in the four one day match series at Jamaica today. The stylish Indian batsman Yuvraj Singh played an awesome inning of 131 runs in the first ODI, and Indian team will rely heavily on him to put up a big score against West Indies as said by Indian skipper Mahendra Singh Dhoni. The area of concern for Indian team will be the opening pair as Gautam Gambhir and Rohit Sharma failed to deliver from last few matches including T20 matches in the ICC T20 World Cup. Indian skipper Mahendra Singh Dhoni praised the Yuvraj Singh who scored 131runs in just 102 balls which includes seven massive sixes as India defeated West Indies by 20 runs in the first ODI at Kingston. Dhoni said that in last couple of years Yuvraj has matured as a batsman and their team now relies heavily on him to fire as Yuvraj plays big innings in the middle order. Dhoni further added that Yuvraj always play aggressively and once he get set on the crease they can hope for big scores as he always scores good with a very good strike rate. As Indian team crashed out of the ICC T20 World Cup, discussion has started on what went wrong during the matches which caused early exit of India from ICC T20 World Cup. 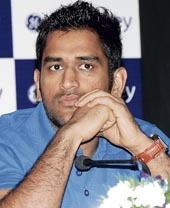 Indian skipper Mahendra Singh Dhoni's captaincy has raised a lot of questions in mind of Indian cricket fans. The foremost question which arises is that why Dhoni opted to bowl first in the match against England. New Delhi, June 15 : Cricket fans across the nation have blamed team captain Mahandra Singh Dhoni for India’s unceremonious exit from the Twenty20 World Cup. England knocked out the defending champions on Sunday when they won the crucial match by 3 runs. India managed 150-5 from 20 overs in response to England''s 153-7 at Lords in London. Nottingham, June 5 : In a unique press conference, the entire Indian cricket team came out on Friday to dismiss reports of any rift within the squad ahead of the Twenty20 World Cup. Captain Mahendra Singh Dhoni read out a statement reflecting unified support for each other and walked out with his team-mates before any questions could be put up. "As we prepare for the World Twenty20, we are a superbly unified team. The team spirit is good as it has ever been, with each individual supporting each other, both on and off the field," the statement read. Muzaffarpur (Bihar), Apr 16 : A criminal case was slapped against Indian Cricket Team captain Mahendra Singh Dhoni and off-spinner Harbhajan Singh in a court here on Thursday for disrespecting the prestigious Padma Awards. Senior advocate Sudhir Kumar Ojha filed the case against the cricketers under sections 499 (defamation), 500 (punishment for defamation), 503 (criminal intimidation) and 504 (intentional insult with intent to provoke breach of the peace). Wellington, Apr. 7 : Indian cricket captain Mahendra Singh Dhoni today praised his squad for gelling together to effect a series triumph in New Zealand after 41 years, and added that it had set a benchmark for future Indian teams to achieve. "It''s a fantastic atmosphere [in the dressing room], can''t get better. We have set the benchmark. Next time when we come to New Zealand, people expect you to win. You have achieved something that''s big, but the tough part is to maintain it, to sustain it. It never gets easy for a cricketer," said Dhoni. Ranchi, Mar 21 : Cricket fans of Indian captain Mahendra Singh Dhoni gathered here in large numbers on Saturday to celebrate India's historic win over New Zealand. Fans burst crackers, distributed sweets and danced to express their happiness. "We are celebrating because under the leadership of Dhoni India has won a test match in New Zealand after 33 years. All the people here are very happy. We are going to pay a visit to a religious shrine to pray that India win the series as well," said Gautam, a young cricketer. In a significant move, the police arrested a man suspected of sending two threat letters sent to the Indian cricket team skipper M S Dhoni last year. It can be recalled that Taslim, who has been arrested here on Thursday, is wanted in over a dozen criminal cases in Jharkhand. Mumbai, Feb. 18 : Indian cricket team captain Mahendra Singh Dhoni said on Wednesday that the forthcoming tour of New Zealand would be a tough assignment, as India has not won a series there since 1996. Dubai, Jan. 31 : India captain Mahendra Singh Dhoni has reclaimed the top rank in the Reliance Mobile ICC Player rankings for ODI batsmen from the West Indies Chris Gayle. Dhoni's 61 not out against Sri Lanka in his side's first ODI of a five-match series has enabled the 27-year-old wicketkeeper-batsman to regain his place at the head of the table. There will be ample opportunity for Dhoni to put daylight between him and the chasing pack as the rest of the series unfolds in Colombo. New Delhi - Indian cricket team skipper Mahendra Singh Dhoni has received extortion threats from a local criminal that his family would be harmed if a demand of five million rupees (102,902 dollars) was not met, officials said Wednesday. Mohammad Taslim, claiming to be a henchman of mob boss Dawood Ibrahim, allegedly sent two letters threatening to blow up Dhoni's house in Ranchi, state capital of eastern Jharkhand, if the payment was not made. The letters also warned the cricketer not to take the threats lightly and not to inform the police about the letters. Ranchi, Dec 30 : Security of Indian cricket captain Mahendra Singh Dhoni was beefed up after his family expressed concern about the security provided by the State Government. Sudhir Mahto, the Deputy Chief Minister of Jharkhand said that ''Z class security'' was provided to Dhoni after there were reports in some sections of media about the security concerns to the cricketer and his family. "We have acted after we saw some reports in the media about the security concerns for the cricketer," he added. Sydney, Dec 26 : Indian skipper Mahendra Singh Dhoni has been selected to lead the team of the year for his fighting and match winning strategies. The other Indian to make it to the team is opener Gautam Gambhir, who scored heavily in 2008.